Here is video #3 in our series on box jumps to decrease the risk of ACL injuries and also to improve jumping performance. Remember these exercises alone are generally not the complete solution. This is just one piece of the puzzle and their are other aspects of training that should be addressed as well if you are looking complete recovery or do all you can to prevent an injury. If you want more information on the topic, be sure click the image below to get your free tips report! 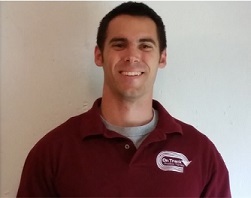 About the Author: Dr. Greg Schaible is a physical therapist/strength coach specializing in athletic performance. He attended The University of Findlay, graduating in 2013 with his Doctorate of Physical Therapy (DPT). As a Track and Field athlete, he was as a 5x Division II All-American and 6x Division II Academic All-American. Greg is the owner of On Track PT and Performance in Ann Arbor, Mi. You can stay up to date with helpful information and news on Facebook. This week I’m posting the second video in a series of three showing how we begin jump training to a box. This type of training can be used for ACL injury prevention and to enhance sports performance. It’s also what we do post-surgically to get the athlete used to jumping again and landing safely. The great thing about box jumps is that the forces on the knee are quite low because you are not coming all the way back down to the floor. It’s also much easier because of this for the athlete to work on proper landing technique. Before I get to the video though I thought I’d post a picture of what you don’t want your athletes knees to look like. Looks fairly simple but let me assure you it can be quite challenging for many athletes – boys included. Learning to jump and land correctly has been proven to help prevent ACL injuries and it must also be a huge focus of any post-surgical ACL rehabilitation program. If you would like to learn more about how to recover from an ACL injury or just better prevent one from occurring, click on the free guide below! It’s a very simplified way of looking at things but it does often work out this way. The knee joint needs to have a great deal of stability in all directions to prevent injury. If the ankle and hip joints above and below are moving well then the knee joint will more likely stay within it’s accepted range of motion during athletic movements. If the ankle and/or hip are stiff then the knee may just have to go outside of it’s normal boundaries to land from a jump or decelerate while cutting. This is where things can go south in a hurry! There is plenty of research out there in the medical and physical therapy journals showing that strength deficits can lead to knee injuries, and in particular ACL tears. Years ago the main concern was the ration of strength between the quadriceps and hamstrings, which if it was below a certain level it could inhibit an athlete's ability to decelerate correctly leading to injury. At On Track PT and Performance, we know that a comprehensive strength program must be implemented to assist in the prevention of ACL injuries. Quality movement is critical for effective strength training as well. Being able to combine these qualities is what we do best, and definitely one of my favorite things to talk about so more to come for sure! Check out the video below filmed by a good friend of mine Joe Heiler. We both use these methods to start teaching athletes to jump correctly using box jumps. The nice thing about landing on a box is that you don’t really have to come all the way back down. Much less strain on the knees and an easy way to work on jumping and landing technique. One of the keys to preventing ACL injuries is to display control of the hip, knee, and ankle during dynamic movements. In particular we want to pay attention to this in the deceleration phases. During this test you will be watching or video taping the client from the front. What you are looking for is an inward collapse of the knee upon landing on the ground. You should notice minimal to no inward collapse of the knee. If the knee frequently caves inward or does so excessively, that would be considered a failed test. The second part of this test is repeatability. You should be able to jump up and bring the heel to the back of the thigh x10 reps in a row without having to reset, loose your balance, or loose explosiveness. This portion of the test forces the client to demonstrate control of the knee while maintaining explosiveness and resisting fatigue. This test could be used as a component of return to play testing or just general screening for your clients to see what exactly needs to be worked on during your workouts.